SCVHistory.com PU1702 | Acton | Future Acton Rehab: Overview of TB Camp, 1940. 1940 — The fomer CCC Camp in Acton at the time of the county's takeover of the facility for use as a sanitarium for tuberculosis sufferers. Caption reads: General view with kitchen and dining room on the left. In 1940, with war looming and the New Deal programs (such as CCC) ending, the county of Los Angeles took over the lease and turned the facility into a tuberculosis camp for indigent patients who were transfered from Rancho Los Amigos in Downey. Supervision of the TB camp was transfered July 1, 1941, to Olive View Sanitarium in Sylmar, then again on Oct. 16, 1946, to Rancho Los Amigos. 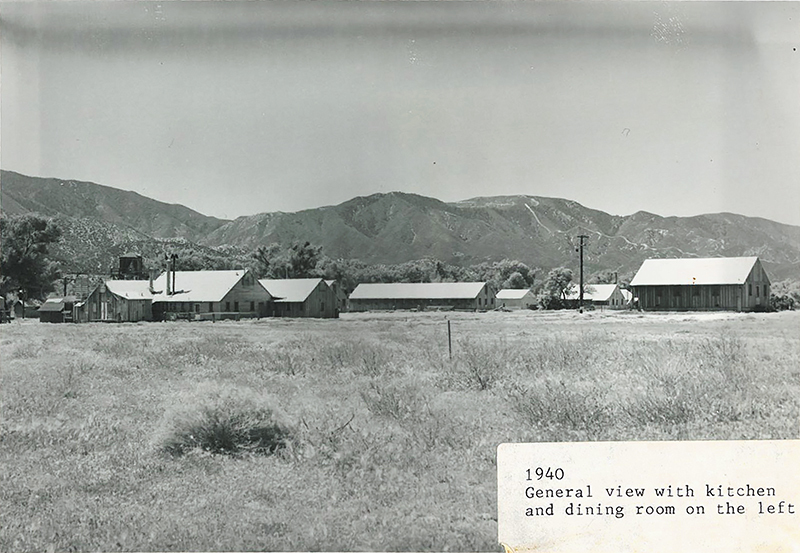 On May 2, 1949, the camp became a separate division of the county's Department of Charities (attached to Olive View Hospital), and on July 1, 1950, the Acton Camp became autonomous. The Acton Rehab Center opened in November 1961 with 300 beds and a 12-step program for an all-male population under the Department of Charities' Bureau of Hospitals. Throughout the mid-1960s, the courts increasingly relied on Acton Rehab to operate 90-day treatment programs for chronic alcohol-related offenders. In 1967, with the breakup of the Department of Charities, the facility's charter fell under the Department of Hospitals. A 20-bed women's unit was added in August 1975, and 20 more beds for women were added in 1979. 2nd annual Alcoholic Olympics at COC in 1974. From 1975 COC yearbook. Click image to enlarge. Castaic resident Kurt Freeman, who taught psychology at COC when the college was new in 1969, was in charge of what were collectively known as the Antelope Valley Rehabilitation Centers in the 1970s — the Acton Rehab Center and Warm Springs, which also had been a U.S. Forest Service-managed CCC camp that started on the same day in 1933. 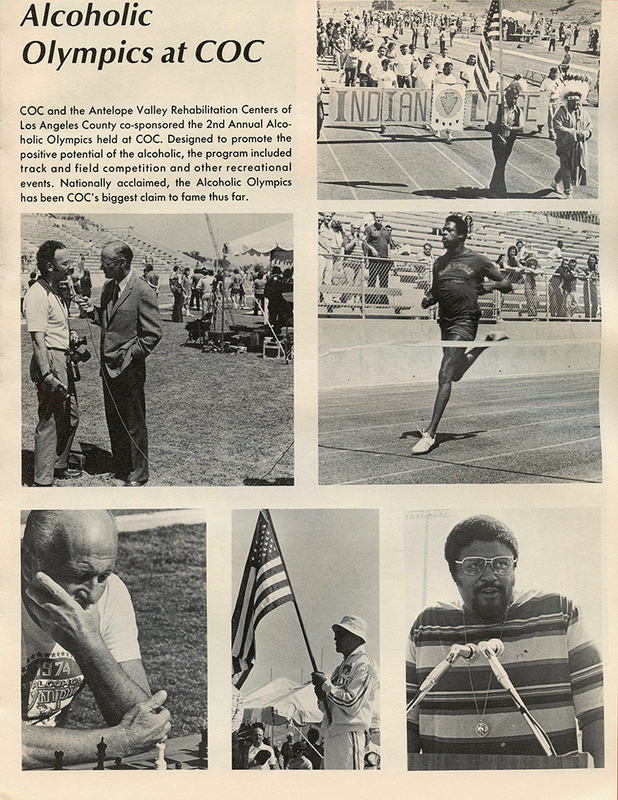 Providing both a physical regimen and a positive goal for recovering addicts, Freeman launched the Al-Impics (Alcoholic Olympics) at COC in 1973. Two other facilities that once were part of the county's rehabilitation system transferred their staff and patients to Acton and Warm Springs by this time: Mira Loma, which became a county correctional facility in September 1953; and Munz-Mendenhall (aka Lake Hughes Rehab) at 42220 Lake Hughes Road, which had been a combination probation-rehabilitation facility beginning in 1959 and now was probation-only effective April 12, 1974. Following Freeman as AVRC executive director was Dr. Richard Rioux, who saw 22,000 recovering drug and alcohol patients come through Acton and Warm Springs' doors during his tenure. Acton was now the nation's largest such facility, and Warm Springs was No. 3. A talented writer and photographer, Rioux created an effective literacy program for recovering addicts. But his career was cut short by his untimely death in 1997 at age 53. The county named a park in Stevenson Ranch in Rioux's memory, Rioux having been a leader in the community where he lived. In 2006, Acton Rehab administration was put under the Substance Abuse Prevention and Control division of the county Department of Public Health. Warm Springs, with 199 beds for an all-male population, closed June 31, 2011, and was consolidated into the Acton campus, which offered two separate, gender-specific programs. Renovations began at that time and were completed in September 2012 when a new kitchen and dining rooms opened. The Warm Fire in Castaic that burned about 300 acres was the result of arson, according to Los Angeles County Sheriff's Department investigators. The Warm Fire began around 3:30 p.m. Sunday, Aug. 16, 2015, in the area near the Warm Springs Rehab Center on Lake Hughes Road in Castaic, according to Angeles National Forest officials. "We're working with several other agencies including the Forestry Department to identify the suspect or suspects and to determine the (specific) cause," Sgt. Robert Boese with the LASD Arson and Explosives Unit. No civilian injuries were reported, according to ANF. 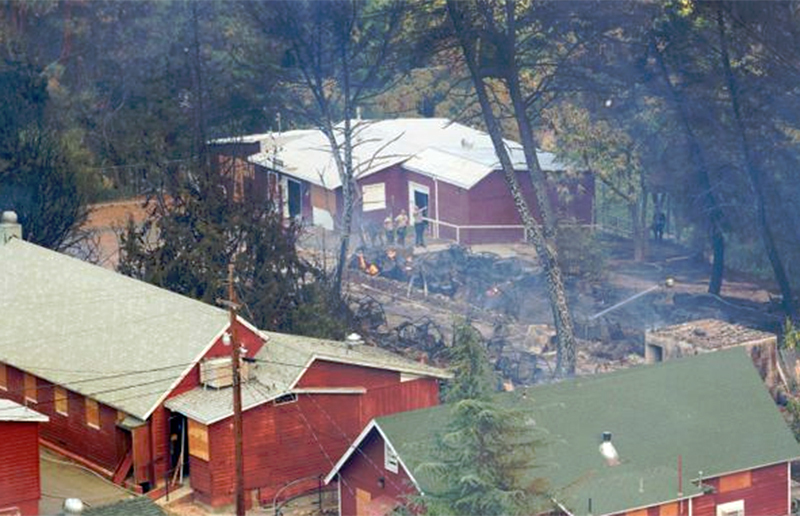 During the fight to contain the fire, two firefighters were relived of their duties due to injuries and about 170 personnel worked to extinguish the fire, while battling rough and steep terrain. The fire, which was located near Lake Hughes Road, burned six structures, according to ANF officials. The Los Angeles County Fire Department employed two helicopters and a DC-10 air tanker were used to fight the fire. The Los Angeles County Sheriff's Department and the Forestry Department are continuing their investigation to identify the suspect or suspects, and cause. PU1702: 9600 dpi jpeg provided by Los Angeles County Department of Public Health.